Everybody’s favourite nutbag Werner Herzog (why can’t he just share the Herz?) returns to the big screen this week for his much-hyped 3D cave documentary Cave of Forgotten Dreams. Shot in April 2010 using custom-made 3D cameras, the film documents Herzog’s visit to the Chauvet Cave in southern France, where the earliest cave paintings known to man reside. The inevitable complications of shooting a 3D movie inside a tiny cave with a crew of three or four people are also illustrated in the film, making plenty of space for some grade-A Herzog self-reflexiveness. It’s a bit like the ‘Behind the Lens’ segments from Human Planet, except instead of elaborate rigging systems and painstaking camera set-ups, we get Werner Herzog walking up a hill spinning a camera around for lolz. Is it just me or could it do with a few more lens flares? 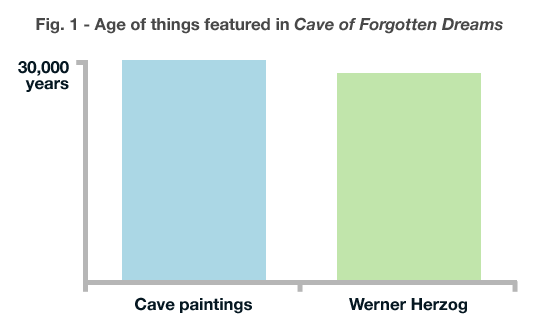 Outside the cave, Herzog offers a wealth of context from palaeontologists, historians and a few miscellaneous freaks, while also providing his inimitably idiosyncratic narration to tie the whole thing together. It’s a fascinating if structurally frustrating entry from the sexagenarian director, who presents us with 30,000 years of human history one minute and then compares himself to an albino crocodile the next. But for breathtaking sights and some genuinely innovative use of 3D, it’s the best film of its kind since Jackass 3D. Now all we need is a crossover.